This edition of the 'Stanley Series' includes an appearance by The Stanley Brothers at Luke Gordon's Silver Creek Ranch in Paris, Va. on 5th August 1956. i.e. 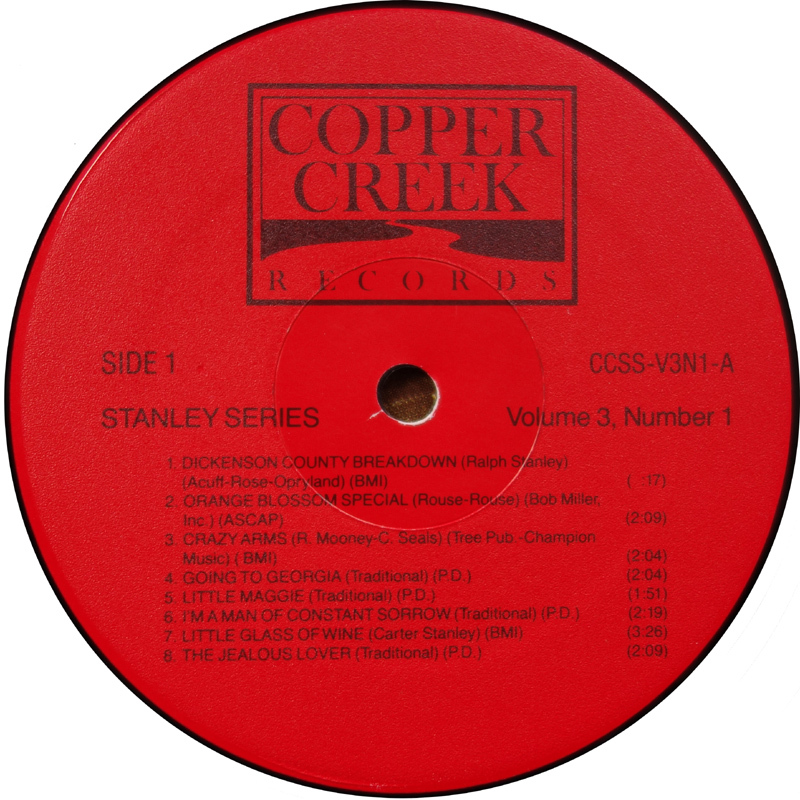 about a week after the New River Ranch set that's on Stanley Series Vol. 4 No. 1. Personnel is the same as for the Shipps Park appearance, and six songs appear on both recordings:- Dickenson County Breakdown, Orange Blossom Special, Crazy Arms, Little Glass Of Wine, Cry From The Cross and Little Birdie. The show is however unfortunately interrupted by heavy rain on a couple of occasions, and as with other tapes recorded by Jeremy Foster, some of the dialogue is cut. As with the other live recordings with Chubby Anthony and Curley Lambert, the performances are top notch. It's just a shame that the rain interrupts Crazy Arms and curtails A Lonesome Night. 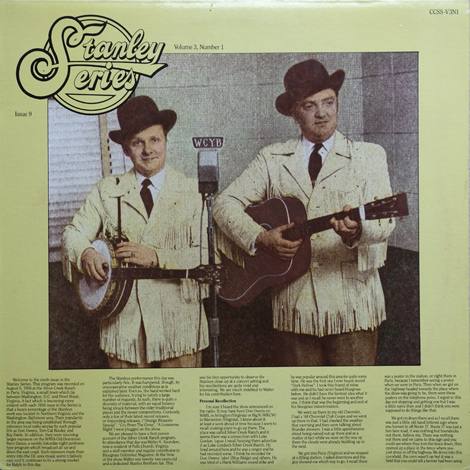 All of the songs are from the Stanley catalogue, except for Crazy Arms which was a top hit for Ray Price at the time and which features Curley Lambert on lead vocal. As usual the album gives are details of each song / lyrics, and the liner notes also include a first hand account on the show from Bluegrass Unlimited's Walt Saunders: "...It was very, very rustic. There were just some real rough boards either nailed across stumps or else they had taken some old pieces of log and laid 'em down and nailed these boards to kind of make these seats. The stage was just up the hill a little bit, the ground kind of rose back towards a hill there and it was fifty feet away from where all these rustic seats were. So there was this open stage... well it was just a platform was all it was. There weren't any sides on it, any front on it, there wasn't hardly anything. It was just a platform." "So they started doing the show and the clouds started coming up real dark and you could hear thunder and everything. They got part way through the show and it started sprinkling. As soon as it started sprinkling pretty heavy and the storm was almost right on top of us, Carter said they were gonna have to stop playing and everything. So they just stopped playing and went back and put their instruments in the car. And of course it rained for quite a while." "Finally it kind of stopped raining and they went back up there and tried to do the show again. They did some for awhile and then it started raining again. They had to shut it down again and went back and stayed in the car, it was the only place you could get out of the rain. There weren't any buildings around or anything. The only thing around was trees, these seats sitting under the trees, and that little stage. There was absolutely no shelter anywhere..."
The Jealous Lover from this show, can also be found on the V/A - Virginia Traditions: Ballads From British Tradition LP. 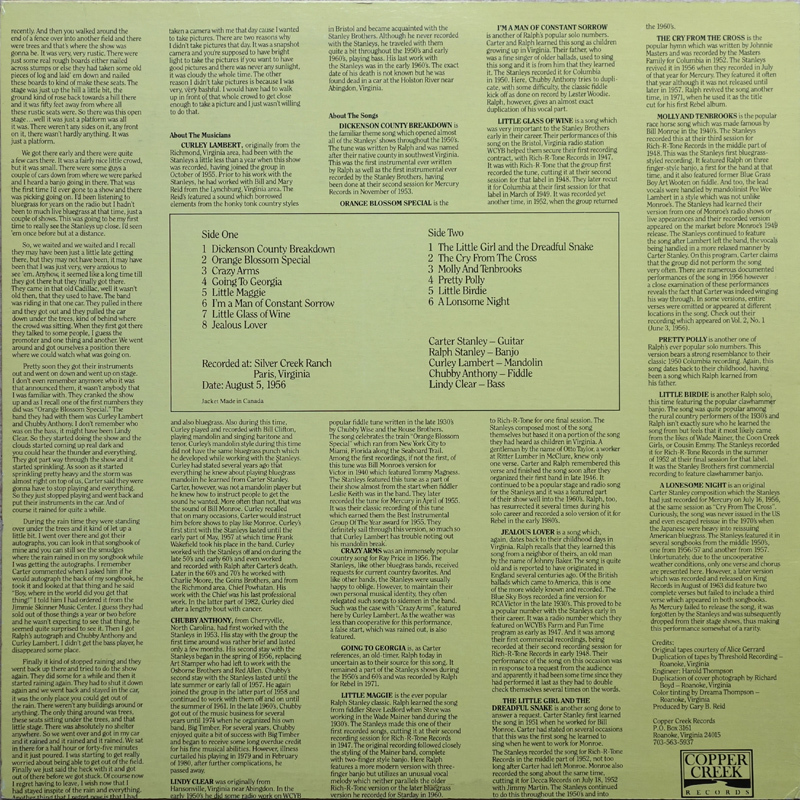 Curiously, the liner notes to that album say "The recording made during this live performance at Silver Creek Ranch, for example, includes the then popular rock-and-roll number, Shake, Rattle, And Roll." I asked Gary B. Reid about this and there is a recording of the Stanley Brothers playing Shake, Rattle, And Roll from a show at Melody Ranch, Glen Burnie Md. from 9th April 1957, with Curley Lambert on lead vocal. It's possible that either the V/A - Virginia Traditions: Ballads From British Tradition liner notes are wrong (and they do give the show date as 8th August 1956), or that there is a different tape recording. i.e. 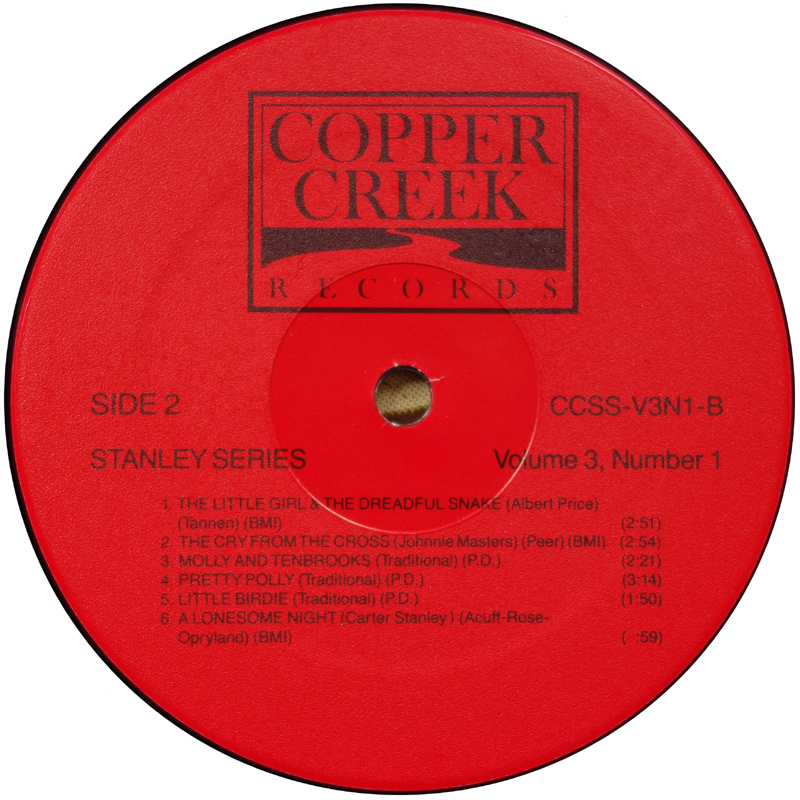 the one used on the Stanley series was recorded by Jeremy Foster, and the one on the other compilation was recorded by Mike Seeger. For more detailed breakdown and background to the show, check Gary B. Reid's The Music Of The Stanley Brothers book, pages 52-55, 61 and 80. NB: (*) Curley Lambert sings lead on Crazy Arms.